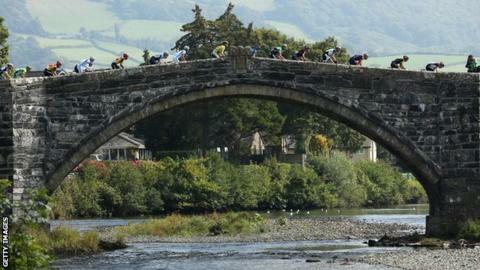 North, mid and south Wales will get a taste of the Tour of Britain cycling event in September. Wales will host the two longest legs, stages four and five, on 7-8 September. Denbigh is the starting point for stage four, which heads through Flintshire and Powys, concluding the Royal Welsh Showground near Builth Wells. Stage five will re-start from Aberdare and take in Rhondda Cynon Taf. The Welsh leg concludes by crossing south Wales and finishing in Bath. Ken Skates, the Welsh Government deputy minister for culture, sport and tourism, said: "We're looking forward to hosting the Tour of Britain again this year and thrilled that some new venues and locations will get a taste of the action. "The Tour of Britain is a fantastic opportunity for us to showcase Wales' unique and beautiful landscape to the world, as well as highlighting our ability to host a variety of major events. "The spectators in Wales have always given the cyclists a real warm Welsh welcome and have created a fantastic atmosphere, I hope that people from across Wales come out to support the event again this year. "Being a part of an event such as this can really inspire people to want to take up the sport." Wales has hosted stages of the Tour of Britain annually since 2010. In 2016, stage four, Denbigh to Builth Wells is 217km and stage five from Aberdare to Bath is 205km, the two longest legs of the Tour.